If you’re a fan of indica-dominant strains, you’re in luck. In this post we take a look at the top 5 indica cannabis strains at Zambeza. 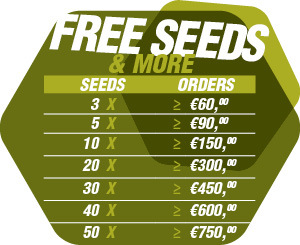 Remember, all of these seeds are available from our website with direct delivery to your door. Indica strains are loved for by cannabis connoisseurs from across the globe for their unique physical effects. If you’re a fan of indica-dominant strains, you’re in luck. In this post, we take a look at the top 5 indica cannabis strains at Zambeza. Remember, all of these seeds are available from our website with direct delivery to your door. Northern Lights is undoubtedly one of the most iconic cannabis strains around. It first made it’s debut in Holland in 1985, although some claim it originated from Seattle, Washington. Featuring powerful genetics that include Afghani and Thai landrace strains, Northern Lights has since gone on to produce a vast variety of powerful hybrids, including Shiva Skunk and Super Silver Haze. Zambeza took these powerful genetics and stabilized them to create a new variety of this classic strain that’s cherished by cultivators across the globe. These plants are cherished by cultivators from around the world for their short flowering times and ability to produce big yields and an outstanding final product. In an indoor environment, Northern Lights plants grow between 120-150cm tall, while reaching up to 230cm when grown outdoors. Average yields range between 550-650g per plant, and flowering times average around 60 days. Zambeza’s Northern Lights XL is extremely easy to grow, making it a top pick for novice growers or even expert cultivators looking to produce a top-shelf strain without much hassle. Northern Lights XL produces long, dense buds typical of sativa strains. They are extremely resinous, covered in a thick layer of frosty trichomes and speckled with thick, red pistils. The buds also give of an iconic aroma, characterized by a combination of earth and pine notes, with sweet undertones. Northern Light XL boasts a high THC content of 19% and produces a very typical indica high. Expect to feel happy and euphoric while experiencing deep physical relaxation. This strain is great for night-time use or at other times when staying productive isn’t a priority. Zambeza’s White Cheese Fast Flowering is an indica-dominant cross between Super Skunk and landrace Afghani. It is cherished by smokers for its powerful effects while cultivators treasure it for its big yields and fast-flowering times (as the name suggests). Unconfirmed rumors claim that the first Cheese strains originated in London in the late 80s. Today, Zambeza has stabilized these genetics to create a powerful cannabis variety that makes the perfect addition to any home garden. White Cheese Fast Flowering plants flourish when grown outdoors. 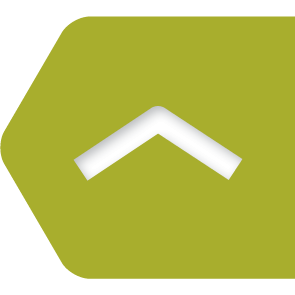 While indoor plants will grow to be short and stocky (reaching only between 60-90cm in height), outdoor plants can reach heights of over 200cm. As is expected, indoor yields are noticeably smaller, averaging between 350-450g per plant, while outdoor yields can exceed 600g per plant. The average flowering time forZambeza’s White Cheese plants is only 50 days. The buds these plants produce boast a very noticeable cheese aroma, underlined by soft spicy notes. They taste quite fresh and spicy and usually grow to be long and super dense. As the name suggest, these nuggets have a frosty white appearance when allowed to mature fully, thanks to a thick layer of healthy trichomes. The fact that White Cheese nuggets tend to be rock solid means growers will need to be extra careful to control the humidity levels in their grow environment to avoid any risk of mold. Hence, this strain may be better suited to experienced growers who can provide these plants with a bit of extra love and care. 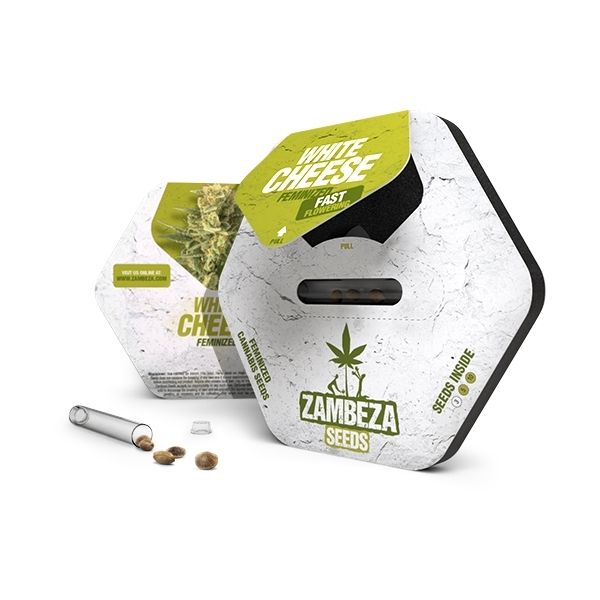 White Cheese has an average THC content of about 17%. Hence, it provides powerful sedative effects and a very relaxed, happy high without completely knocking you off your feet. Most users love this strain because it still leaves them with enough focus and concentration to go on with everyday tasks. This strain got a lot of attention after featuring in the 2008 film starring Seth Rogen and James Franco. The origins of this strain are very clouded. Some say it originated from Hawaii while others claim it was created by G13 labs. Either way, Zambeza’s new Pineapple Express provides a fresh spin on this popular strain and makes for an excellent grow indoors, outdoors, or even in a greenhouse. If you’re looking for bigger yields, we suggest growing Pineapple Express outdoors. Indoor plants will generally grow to 100-130cm and produce around 550g per plant, while outdoor plants can easily reach heights of 170cm and produce harvests of 650g per plant. The average flowering time for Pineapple Express is 55 days, making it a great choice for anyone looking to harvest some top-shelf bud quickly. These plants produce beautiful light green buds, speckled with red pistils and coated in a frosty layer of THC-rich trichomes. They are usually quite dense, and boast a deliciously fresh, tropical aroma with notes of apple, mango, and, you guessed it, pineapple. One of the biggest differences between Zambeza’s Pineapple Express is that it is an indica-dominant hybrid (many other varieties claim to lean more to the sativa side). A cross between California OG Kush and Pineapple, a Jamaican hybrid, this strain will leave you extremely happy and very relaxed. With THC levels averaging around 19% this is a hard-hitting strain that may leave you glued to the couch if you smoke too much. If you’re looking for a new indica cannabis strain that is easy to grow and produces large harvests in under 50 days, this is the strain for you. Candy Caramelo Fast Flowering is a Zambeza original and is a 3-way cross between Maple Leaf Indica, White Rhino, and Blue Black. With such strong genetics, you can expect these plants to produce extra-powerful buds that’ll leave you relaxed but creative. Similar to some of the other strains in this list, Candy Caramelo really flourishes outside, especially in warmer climates Indoor plants will generally grow between 60-90cm, producing roughly 400-500g per plant. Outdoor plants exposed to plenty of sunlight, however, may grow up to 240cm and produce harvests exceeding 600g per plant. The average flowering time for Candy Caramelo is 45 days, making it a favorite among cultivators who want to keep their grow costs down but not sacrifice the quality of their weed. The buds produced by these plants are exceptional. They are elongated and dense, and usually feature a distinct candy-like aroma that’s sweet, fresh, complete with subtle notes of caramel. The taste is slightly more mellow and even features subtle undertones of mint. With a THC content of 16%, Candy Caramelo produces very mellow effects. Expect to experience strong physical relaxation with still enough focus to get creative with music, art, or even work tasks, making this a great smoke for any time of the day. Last on our list of our top feminized indica cannabis strains is Lemon Kush, a complex cross between Chemdawg, Lemon Thai, and Pakistani Kush. This strain is treasured by growers and cannabis connoisseurs alike for its calming effects, powerful genetics, high yields, and short flowering times. If you’re looking to reap the biggest yields from these plants, we definitely recommend growing them outdoors. Indoor plants usually grow to 100-130cm and produce yields of about 450g per plant, while outdoor plants can grow up to 230cm tall and produce astonishing harvests of over 550g. Similar to Pineapple Express, Zambeza’s Lemon Kush variety flowers in roughly 55 days. It is a very manageable and resilient strain, making it a great choice for novice growers. The buds that these plants produce are truly world-class. They are long, thick, and completely covered in sticky, frosty trichomes and very few pistils. They also feature a strong citrus aroma underlined with very subtle hints of spice. The effects of Lemon Kush are very heavily influenced by its heritage; expect some deep physical relaxation thanks to the Pakistani Kush combined with just the right amount of cerebral stimulation from the Lemon Thai and Chemdawg.